Now isn’t this cute – we all know that environmental awareness has risen a whole lot in the past decade, but the work is far from finished – otherwise we ourselves would be finished if we continue with the wanton destruction of the planet and environment through various methods including non-organic farming practices, genetically modified foods and lifestock, fuel guzzling vehicles, heavy use of plastic bags and styrofoam containers – the works! 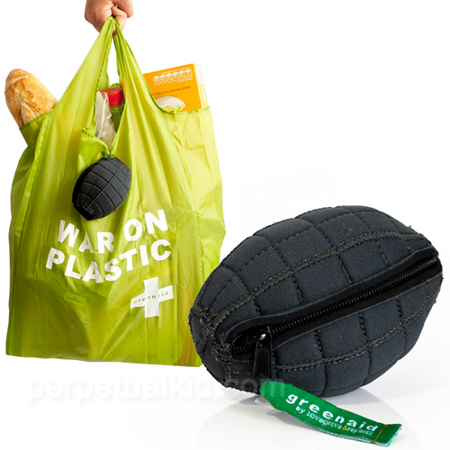 Green-Aid intends to bring the fight to these environmental threats with their $19.99 Grenade Shopping Bag that sends a clear message against plastic. This re-usable shopping bag is definitely fun to tote around, and it surely sends the right message to the rest of the shoppers who still rely on plastic bags that kill sea turtles to carry their merchandise home. Made out of neoprene, it can hold approximately 4 gallons of items. When you’re done, just tuck the bag back into it’s cover and you’re good to go. It would be better if this was made out of 100% biodegradable material though.